Alec Boudreau, a third-year Renaissance College student at the University of New Brunswick, never thought changing schools after being bullied as a kid would have such a positive impact on his life. Mr. Boudreau, originally from Alberta, has spent several years serving as a champion for the French language. This strong advocacy for Francophone Canadian youth recently landed him a seat at a state dinner in Ottawa hosted by Prime Minister Justin Trudeau on Feb. 11, 2016. He enjoyed an exquisite three-course meal in the company of many of Canada’s cabinet ministers along with well-known names like Marc Kielberger and Sun Myung Moon. As president of the Fédération de la jeunesse canadienne-française (FJCF), The Federation of French-Canadian Youth, Mr. Boudreau only found out about this state dinner a few days prior to hopping on a plane to Ottawa. Mr. Boudreau has been involved with the francophone community since he was in Grade 11. Although his father was a French Acadian from Nova Scotia, he grew up in an English-speaking home in Hampton, N.B. Mr. Boudreau was bullied at his English school as a child and transferred to a local French school — Centre Scolaire Samuel de Champlain. This was a welcome change for Mr. Boudreau as he identified with that part of his heritage once it was known to him and he was fascinated with the history of French language and culture. After this transformative trip, Mr. Boudreau became increasingly involved in the Fédération des jeunes francophones du Neauveau-Brunswick (New Brunswick Federation of Francophone Youth)—a provincial organization for francophone youth. “I wanted to create a connection to the language and culture that I didn’t grow up with,” he said. At the age of 21, Mr. Boudreau is fairly well-travelled. In his third year of a bachelor of philosophy in interdisciplinary leadership at UNB he has had the opportunity to spend the summer of 2015 in several oceanic countries, including the Kingdom of Tonga and New Zealand. Mr. Boudreau chose Renaissance College at UNB because he was looking to get more life experience out of a university degree. 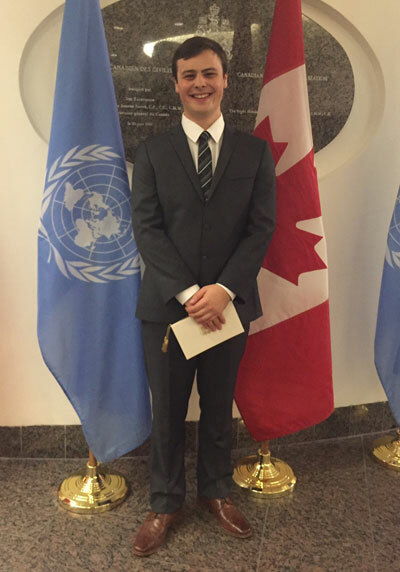 Mr. Boudreau is expected to graduate in August 2016, and will undertake a parliamentary internship in Ottawa through the Canadian Political Science Association in September of this year. He has also been accepted into McGill University’s faculty of law. The Federation of French-Canadian Youth is a national organization run by and for young people. Its membership is composed of eleven youth associations in nine provinces and two territories. It contributes to the socio-cultural development and identity of young French Canadians between the ages of 14 and 25 through youth employment programs and national events. The University of New Brunswick (UNB) is Canada's oldest English-language university. Founded in 1785, the multi-campus institution has a rich history and a dynamic focus on innovation, experiential learning and entrepreneurship. UNB has nearly 10,500 students from nearly 100 countries while several thousand more take UNB courses online and at partner institutions around the world.